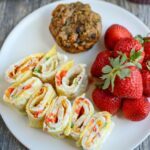 These Omelet Spirals are a fun, kid-friendly twist on egg wraps. Add your favorite mix-ins and whip up a batch in just a few minutes. Perfect for school lunches, breakfast and snack time! meat, optional – deli meat turkey or ham works great, as does pepperoni. You could also use chicken sausage if you chopped it very finely. veggies- i used finely diced red peppers and green onions. You could use green peppers, mushrooms, etc, just make sure they’re finely diced. Make sure all mix-ins are finely diced. Crack one egg in a small bowl and whisk well. Pour into a medium hot skillet (greased with butter or oil). Tilt pan if needed to spread egg into a somewhat circular shape. Quickly sprinkle your desired mix-ins (meat and veggies) all across the egg. After 45 seconds to a minute, flip the egg wrap, pressing down with your spatula afterwards to help secure the mix-ins. Cook an additional 30 seconds, then flip back over and place on a plate. Sprinkle with cheese and roll the wrap up. Cut into 4 spiral pieces.